Harley Davidson’s Hydra-Glide was a significantly improved bike design, one that would carry the company through the next 17 years. The hydraulic-valve “Panhead” engine was introduced in 1948, and the telescopic front forks that gabe the bike its name came out the next year. Powering the Hydra-Glide was a 74 cubic inch, 55 hp, OHV V-twin engine fed by a Schebler carburetor, a four-speed hand-shifted gearbox, a bucket saddle, telescopic Hydra-Glide front forks, a hard-tail rear end, a hand-operated front drum brake, and a foot-operated rear brake. The new engine was notable for its aluminum cylinder heads with bronze valve inserts and steel guides, and the cylinder heads also had steel inserts for the cylinder bolts and plugs and used push-rod-type hydraulic lifters in the valve train. The rocker arms and cylinder heads were completely redesigned from the cast-iron “Knucklehead” engine, and the aluminum heads dissipated heat faster. A new camshaft, new exhaust ports and a new intake manifold gave an extra 5 hp and a larger oil pump boosted oil flow 25 percent to the valves where it was needed. The Hydra-Glide FL also saw the front brake increase in size by 34 percent for 1949, while the saddle gained padding and the hand-shift pattern was reversed for the rider to be able to push away to change up gears. A foot-shift and hand-operated clutch was offered in 1952, the last year for the 61 cubic inch motor, which sported a wider gas tank and wider tires. 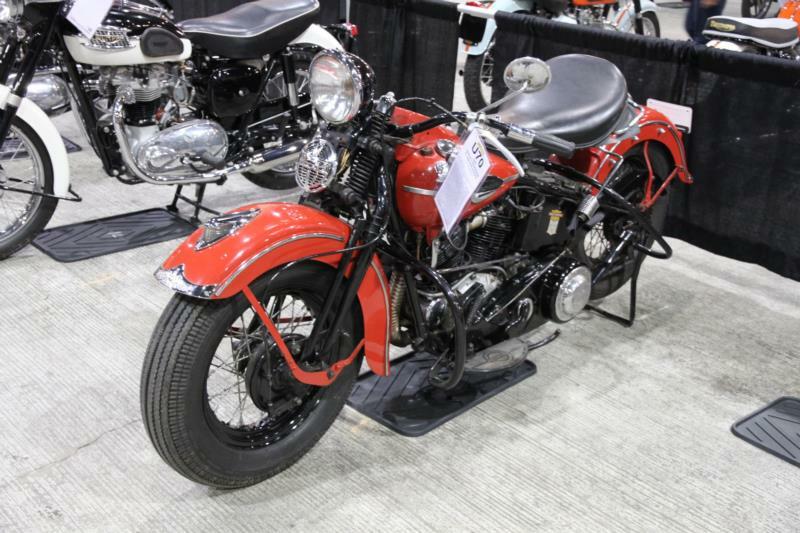 The 1953 bikes also featured a large gold badge for Harley’s 50th anniversary, and in 1956 the Panhead motor gained high-lift cams and a flow through air cleaner for a 12 percent gain in power. In 1958, the Duo-Glide name first appeared with rear suspension by a swing-arm (hence the “glide” front and back), and larger cylinder head fins for improved cooling. The model characterized “Dressers” and the increasing number of accessories included Royalite saddlebags, whitewall tires, a floating Buddy seat with chromed grab rail and dual exhausts. The Duo-Glide was available as the FL and FLH, (H for Highway). Early 1960s improvements included a headlight nacelle similar to the Sportster, a larger chain and new chain oiler, and external oil lines to the valve gear. Full-width alloy finned front brake drums were then added in 1964. The next development would be the arrival of three new Harley-Davidson models in 1965, including the Electra-Glide tourer, which gained a12-volt battery, push-button electric start and a full five-gallon fuel tank.